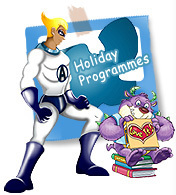 ‧Home > Holiday Programmes > Summer Holiday Programme! Our Summer Holiday Programme is a fun filled holiday programme designed for Nursery 1 to Primary 6 students. It is an opportunity for students to develop their English skills in a stimulating environment that encourages language enrichment and development. Using our integrated learning approach we ensure that all types of learners (visual, aural and kinetic or action-oriented) have the opportunity to develop their language skills. Our classes are student centred, which allows the student to be an active partner in the learning process. This encourages both confidence and a sense of security in their language acquisition and development. In each class students will engage in vocabulary building exercises related directly to the theme of Summer and any associated international and/or national holidays (such as Dragon Boat Festival) that fall within the scope of the theme. This vocabulary building will equip students with the necessary vocabulary to express their feelings, thoughts and opinions regarding the theme. In order to facilitate these exercises and improve general pronunciation, students will develop their phonics skills by learning to differentiate between different sounds as well as recognise a sound’s various written forms. Students will also be taught and practice sentence patterns that utilise the new vocabulary to help them develop a deeper understanding of the theme and be able to express themselves confidently. These sentence patterns are essential to the development of communication skills for younger learners and fantastic conversation starters for older ones. The vocabulary, phonics and sentence pattern learning are all enhanced by a variety of stimulating songs, games and activities that encourage retention as well as create a fun filled environment for the learners. Having fun and feeling comfortable with the materials is central to our Summer Holiday Program as it fosters learning and language development. Each lesson’s arts and crafts portion is designed to reinforce language learning and enhance creative, motor and problem solving skills. Primary learners will also have an opportunity to practice and develop their reading ability. Reading exercises will help develop reading fluency, comprehension and their knowledge of the Summer theme. In addition to reading, primary learners will engage in creative writing. This is an opportunity for them to practice their writing skills and learn how to express ideas confidently and thoughtfully. At the end of each week we encourage our students to participate in a fun, confidence building mini-performance that showcases a small amount of what they have learnt during the fun packed week of learning, creating and making new friends.